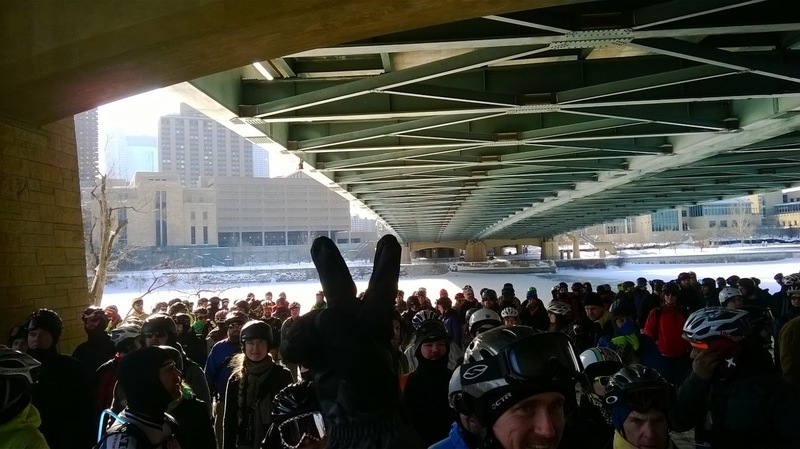 A winter alley cat in Minneapolis: yeah yeah, it's cold, it's icy, it's wet but something about bringing 300+ people together all for the sake of a yearly race, in the middle of winter, is very special. There are two choices if you want to race Stuporbowl: Speed and Stupor. The speed race has more checkpoints and only a signature is needed at each stop to continue. The Stupor race is not as long but you're required to have one drink before getting your manifest signed off. All in all the weather wasn't too bad. When we pulled in on Friday night it was around -14C but it warmed up on race day to nice and balmy -10C and bluebird skies. I think we had it pretty good given that previous years had been hit with both big snow storms and bitterly cold temperatures. 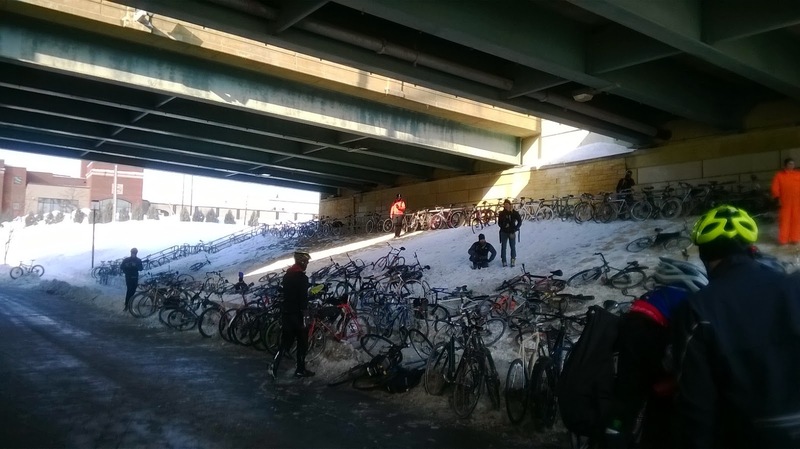 Minneapolis is consistently freezing throughout the entire winter so there was still a ton of snow on the ground, as well as a waist high snow banks everywhere. I thought I'd try my luck at the Friday night alley cat after registering for the main race. I got some confusing directions from some locals and took off. The race consisted of taking pictures of different signs around downtown. Between getting lost a good number of times, checking the map on my phone, bailing into a snowbank due not being able to stop at all on the icy streets (turns out bringing a brake-less track bike to a winter race in Minneapolis is not the greatest idea) and getting directions from these two girls with thick Minnesotan accents I managed to place third. 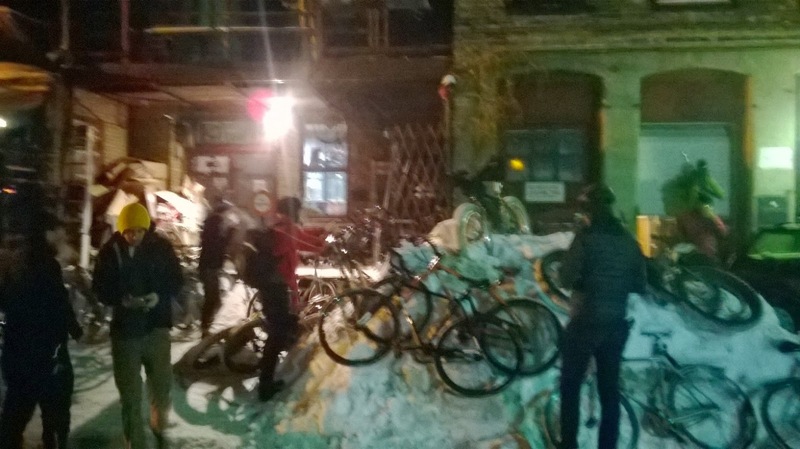 On race day we all gathered in the alley behind One on One which is a combinations cafe and bike shop. Once registration was cut off, the race organizers led us across Hennepin Ave bridge to Nicollet Island which is in between downtown Minneapolis and St. Paul in the Mississippi River. 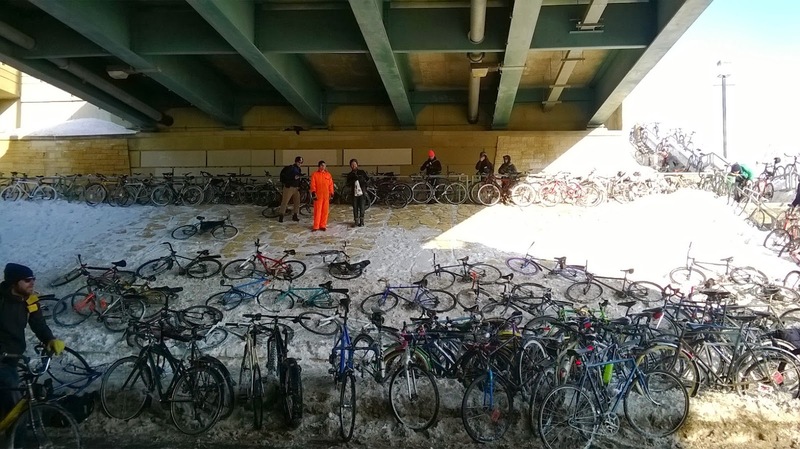 The start line was under the bridge and we all had to line/pile our bikes up and then gather across road in a snowy field. The moments before a race is nerve racking as it is, let alone with 260 other people all doing the their pre-race dance. The organizers said a few words and then we were off. The mass start and everyone running for their bikes was a bit confusing but I managed to find the group of friends I had decided to try to follow and we headed to the first checkpoint. 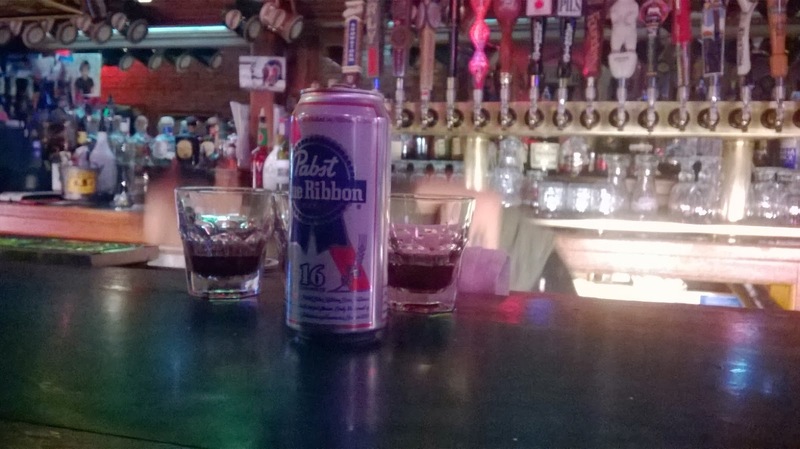 We got to the first bar, ran in, did a shot (the fastest, but maybe not the most logical choice) and ran back out. I had mistakenly decided to take one mitten off to do my shot and was lagging a bit trying to get it back on. I ended up loosing my group and spent a bit of time following others until I got totally lost. Only after one checkpoint and getting lost for a good amount of time I decided to slow down a bit and just check out the other checkpoints. Given that all of them were bars and peoples houses the rest of the day was more of a bar crawl then a race. At one bar there were hot dogs and beer cheese soup and at an other someone had built a fire on the side patio. The day turned into more of a tour of the city and I didn't feel so bad about dropping out of the race. The after party was the perfect way to end the weekend. The winners all received their well deserved prizes of frames, bags, and all sort of other goodies and then it was party time. Between the rendition of Copacabana by SK and the nearly instant shirts off party that happened in a matter of seconds, it was a wild night. Major kudos to the champs of Stuporbowl and anyone who finished it. 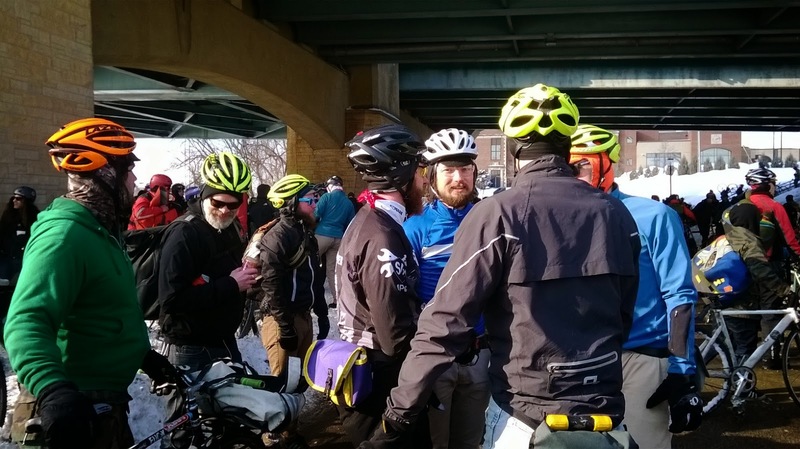 It takes some major chops to ride over 60 km in below freezing temps and for some of them, being to hold your liquor during that much physical exertion. I will most definitely be going back next year. If not to race again and try my luck at largest alley cat in the world, but to hang out and witness this truly unique event.